The Abbasid Empire around 750 C.E., with Baghdad as its capital. 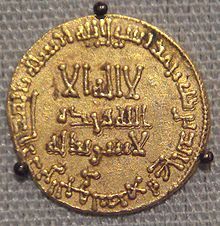 Coin of the Abbasids, Baghdad in 765. - Baghdad emerged in 756 C.E. along the Tigris River as the new capital of the Abbasid Empire. -The Abbasids had conquered the previous Umayyad Dynasty and taken over the general Middle Eastern area as well as part of North Africa, totaling to about half a million people in the Abbasid Empire. The new capital of this empire became Baghdad. - The appetite of urban elites for luxurious goods spurred both the desire for foreign products and production within the city. Muslim merchants, particularly Arab and Persian, became significant players in most of the Afro-Eurasian trade routes. -These included: Mediterranean Sea routes, Silk Road, Sahara routes, and Indian Ocean routes. -During the 8th century, the Arab and Persian traders had established a colony in Canton (southern China). >This linked the Islamic empire with Asia's large economy. >Forms of banking, partnerships, business contracts & foreign tactics generated a prosperous & commercialized economy. - Thus, expanded trade helped boost the economy of the Abbasid Empire, spurring social changes, greater innovation and new technology. This only increased the wealth of Baghdad and allowed the city to grow even richer with cultural influence and idea exchange. Wheat was introduced to the Middle East through trade. -The expansion of Islamic civilization contributed to exchange of agricultural products/practices among regions. >Conquering northwestern India opened the Middle East to many different types of crops. >Rice, sugarcane, sorghum, hard wheat, bananas, lemons, limes, watermelons, coconut pals, spinach. -The Middle East then started to trade these products among their region, as well as with Africa and Europe. occurred because of job specialization, which lead to urbanization and the growth & development of the Middle East, especially the Muslim capital of Baghdad. Ideas about astronomy were also exchanged. -The exchange of technology also occurred. Africa from the Islamic empire. the government by allowing for written records. -Mathematics, science, and medicinal practices were just a few more ideas and innovation that were traded. >Algebra is perhaps one of the most important developments of this time. -Building upon earlier Greek and Indian practices that had been traded, physicians diagnosed many diseases such as hay fever, measles, smallpox, rabies and diabetes. -The Islamic World also developed the first hospitals and traveling clinics. The Islamic medical practices were exchanged among Europe, where they remained the basis of European medical practice for a long time. -The House of Wisdom was established in Baghdad in 830 C.E. This was an academic center for research and translation of ideas that had been exchanged from other regions. -Philosophers, who advocated logic and rationality, often came to disagreements with heavily religious people who relied on the Quran as their path to God. This was the first time that the Islamic Empire saw the split between science and religion, because more and more philosophers argued that reason, rather than revelation, was the clearest way to truth. -Overall, expanded trade to the Muslim Empire (including Baghdad at its center) allowed for technological ideas to be enhanced and improved, and then passed on to other empires where the innovation was increased further. Many of the same practices then can still be seen in today's society. Looking at the Abbasid Empire capital of Baghdad, it is clear that the impact of trade expanded the city greatly and allowed the Abbasids to increase innovation and technology. In terms of art, the exchange of ideas to Baghdad increased the creativity of the artisans and different techniques were used to create sculptures, paintings and more. As the Abbasid Empire grew wealthier, their empire expanded, changing the geography to include much of the Middle East, North Africa, and northwestern India. Military strategies also improved when the Abbasid Empire took over and brought with them different tactics. The social structure of Baghdad (as well as throughout the Islamic Empire) changed because, with expanded trade, a larger merchant class formed. Along with merchants, more artisans, philosophers, astronomers, and physicians emerged and new ideas were exchanged from older Greek and Indian practices. In terms of religion, the Islamic faith was spread rapidly by the Abbasid Empire through India as well as North Africa. Intellectual thinking also vastly increased due to the variety of new scientists mentioned before. Logical reasoning started to catch up with religion, and significant breakthroughs in mathematics and astronomy were made. Technology also increased in Baghdad due to the expansion of trade, providing the Muslim Empire with new weapons, instruments and techniques that were ultimately improved upon and then passed to other regions. The economy boosted in Baghdad with the vast amount of goods and ideas traveling in because the middle class increased, giving them more money to spend on the local economy. Major continuities that come with the expansion of trade to Baghdad include most of their innovations in medicine, math and science that can still be used today. A more general continuity is that empires, over time, continue to exchange ideas and then improve upon them with updated technology and new discoveries. An example of a change that occured was the philosophical thinking that logic leads to truth rather than religion. Strayer, Robert W. "The Worlds of Islam." Waysof the World. N.p. : n.p., n.d. Print. "Abbasid Caliphate." Wikipedia. N.p., n.d. Web. 6 Jan. 2012. < http://en.wikipedia.org/wiki/Abbasid_Caliphate>. "Baghdad." Wikipedia. N.p., n.d. Web. 6 Jan. 2012. < http://en.wikipedia.org/wiki/Baghdad>.